David Watson was born into a farming family in Jamaica. He came to visit his brother in Croydon and stayed, working initially as a chef before joining the Armed Forces which led him to come to Leconfield as an Army Transport trainee. During his time in the Forces, he served in both Iraq and Kuwait. Hull has been David's base since 2002 having met his wife on a night out at LAs Nightclub and subsequently raising five children here. He describes himself as 'having taken the long way around' to become an electrician, realising his childhood ambition by starting his own electrical business and proving his teachers wrong in doing so. 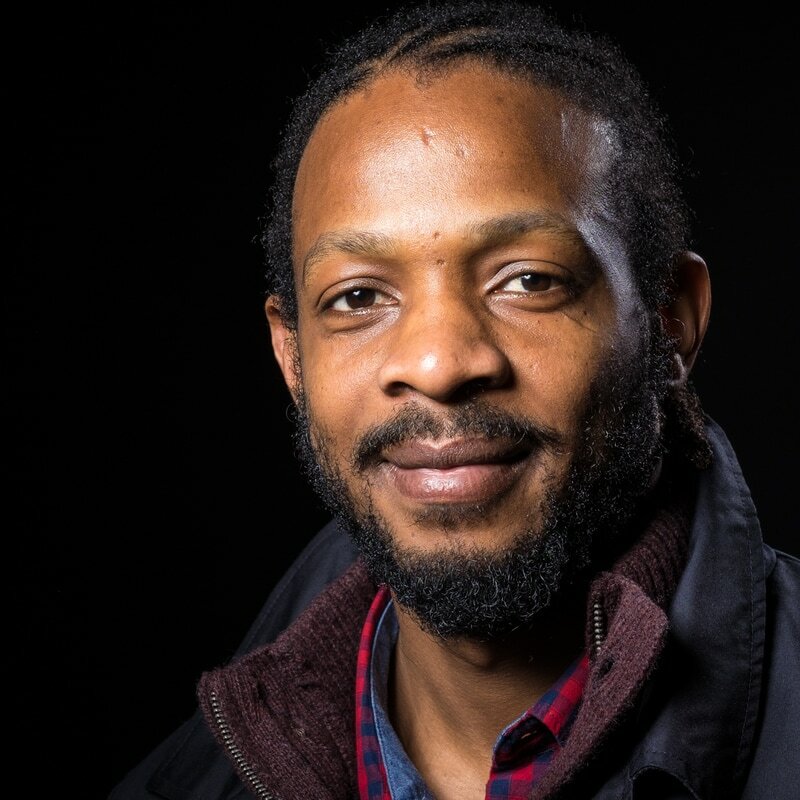 DW: Well my name is David Watson, originally from Jamaica - came across to England, 2001 and - lived in Hull since 2002. JW: So - tell me about your childhood in... Jamaica, then. What's your, what's your earliest memory, for example? DW: My earliest memory ... growing up in Jamaica, was pretty much kind of - living pretty much living on a farm kind of thing, so it was kind of hard work, it was hard graft. I went to, went to a primary school and after primary school I went to high school. I had an OK education, but because of working all the time, doing hard work I was tired most of the time when I was going to school. JW: So was farming the family business? DW: That was the family business, yeah. JW: What sort of farming was it then? DW: It was mostly livestock, so we used to - grow a lot of pigs and - some cows and stuff like that. We did do some vegetable farming, and stuff like that as well. Things like carrot and onions and stuff like that. JW: What were your mum's - sort of family history, ancestors? Were they all involved in farming? DW: Yeah, from what I can remember, because, they pretty much carry on from where - their parents had left off. So they would have been just - small farmers in Jamaica really. JW: Did you know your grandparents? DW: No, I didn't. I didn't. My mum didn't even know her own mum, so she passed away quite young. DW: But it was daddy who, well granddad, who took care of my mum. Yeah. JW: Do you ever feel as though you want to find out more about your family history? DW: Yeah, yeah! I've thought about it, but I might get there at some point, we'll see how it goes. JW: So... school then, what was school like then, you know your earliest school memories? DW:... I was pretty quiet at school. Well going to kindergarten, I don't remember very much of that. Going to primary school, I remember a bit, some of it, I didn't, I wouldn't say I enjoyed school very much. I used to go for the sake of going. I did reasonable well, I would say, at school, but maths, in terms of subject, I liked maths very much. English I didn't like - so much, I didn't do too well at English, maths was OK.
DW: Yeah, I was, I played cricket and football for the, for the team, for the primary school I was going to. JW: What about sort of out of school activities, anything that you flourished at? DW: Out of school it was pretty much the same, a bit of cricket with my friends, and football as well with my friends, just kick-about in open land really. JW: What was your neighbourhood like where you grew up? DW: Neighbourhood, I would say - was very, I don't know if you could say quiet, kind of neighbourhood or working class kind of neighbourhood, where you get people pretty much doing similar stuff, which was mostly farming. JW: What about family, have you got many brothers and sisters? Was it a large extended family or not? DW: Well, I'm, my mum, she's got three sons. I've got one half brother by my mum's side. 'Cos my oldest brother he's, we're not the same dad, but my younger one, we're the same dad, but - In terms of my dad, my dad's got about ten kids, or more. But I would say those are half brothers and sisters. But, we're not very close. But the three by my mum, we, we're quite close. JW: So are those family members, those siblings, are they in the UK or are they still back in...The West Indies? DW: Well, we're, the two by my mum used to live here, but one went to America and the other back to Jamaica. So at the minute it’s only me living here. JW: So tell me about your wild teenage years then! What did you get up to as a teenager? JW: Did you have any ambitions then as a teenager? Can you remember thinking, oh right so when I'm 30 or whatever, I want to be this or I want to be doing that. DW: Yes, I did. I can remember from the age of ten that I wanted to be an electrician. And even though I've only just recently be - become a qualified electrician. Which is around three or four years ago, that I become a qualified electrician, which kind of shows you how long it actually took me to get there....Instead of basically I should have went back to college after high school, but I didn't. When I came across, one of the things I could do, and was encouraged to do, was to join the army and I joined the army - sort of about 2002. That's when I came to Hull, I think a bit earlier than that, but, after that I came to Hull, to Leconfield to do driver's training. JW: Why, why did you join the army? DW: I think - even though my dad wasn't there at the time when I joined the army but, from what I remember of him, he, he's always wanted kind of a 'soldier son', or something like that, so I think subconsciously, that probably might have played a part in me joining the army. But I think, the other part of it, me joining the army, I think purely, is probably, learning to fire a gun, I think. I think that was a major attraction. It was a job as well, you know. You, when you join the army you could, it was some sort of, of achievement, to, to join, which it is in a sense, because it's, you feel like you've achieved something because it's such, it's so difficult, to - to get through the, the beginners', the early stages of it, like your phase one or phase two training and stuff, it is, it is really difficult. So when, when you achieve that and when you actually pass it and then realise that, 'I've actually done it! ', is really a sense of, of achievement, I would say, yeah. JW: Did you do any tours? DW: Yeah, I did. ...I went to Iraq - they class it as a peace keeping mission, when I went there. I was backward, backwards from Iraq to - to Kuwait. But most of my time was in Ira... Iraq. I was at the Basra airport in Iraq. So I spent three months out there, yeah. JW: What are your thoughts about that? DW: I, I thought it, to be fair, it was really peaceful, when I was there, until I came back and after coming back, it, it all changed, and it was really violent and you know you had a lot of shooting. And not only shooting, even though if they didn't kill anybody, but they would star, start... it was certainly more aggressive. Where you find that there were more attack, attacks on the British base and bombings and stuff like that. JW: What year was that, sorry? DW: Ooh, that was about 2003-2004. Yeah. JW: Mmm, yeah, right in the thick of it there. JW: Right OK, let's just take a step backwards though. What caused you to come to the UK? DW: Well, that was family invitation. As far as I can remember, it was my uncle who invited my brother, then my brother invited me. Then when I came across, at first, to be honest I didn't really like it, it was really cold and stuff and... But he kind of encouraged me to stay on, and because he was my older brother, so I kind of stick around. JW: So was this an invite to come and work together? DW: No, no it was just to come and visit when I, when I first came across, it was just 'Would you like to come to the UK?' Well first of all it was my mum, who my brother asked if she wanted to come across and she was like, 'Erm, not really! You can invite your younger brother and see if he wanna come' and yeah... But my younger, youngest brother wasn't happy, he was still at ... college, well say high school it's called, Munro College. That's where he was attending then. He, he wasn't very happy because me and him was really close. He, he wasn't happy that I went and left him there, but then he moved across, when he came across he didn't fancy it. By then I've got kids, so my option was kind of limited, I wasn't going to go anyway. JW: OK, let's explain a little bit more about the differences as to why you found yourself happy in the UK and, and not your, not your brother. What were the attractions or the distractions? DW: I think - I, I can't really put it down to one simple, simple explanation. But I would say, - probably just finding a life, finding a girlfriend, you know that, starting a relationship, I would, I would say probably. Probably if I didn't started a relationship, probably I would have said, 'Alright, I'm going back home'. JW: Are you more outward going and more sociable than your brother ...perhaps or…? DW: I wouldn't, I wouldn't say. But when I find my girlfriend I was, I was in love with her, pretty much straight away. So that kind of connection, I didn't want to lose her. JW: Let's talk about the moment that you arrived in the UK. What was the sort of initial impact? DW: Well it was very different. But I'm looking back on it and I'm thinking, well I was living in Kent at the time, that's where my brother lived. And - I, I really didn't have any issue , then with we kind of moved round to Croydon, which was see... a lot of Jamaicans live round Croydon and stuff, so the community...you kind of see people who are similar to you from the same places so you see you kind of get on with people and then before you know it kind of start fitting in and then you start thinking, 'This is OK!'. You get a job and before you know it, you know you start to feel as, as part of a community, so you feel welcome and stuff. So Yeah. JW: What was your first job then in the UK? DW: My first job in the UK was, was working as a chef. Because my brother, he's a chef... he went to, I think, Westminster College and studied, pastry and whatnot, so he invited me to that and I did that for a bit. JW: So how did it come about that you moved north from Croydon, or wherever, up to Hull? DW: Right, so when I ended up joining the army ... the army training centre for - for their drivers was Leconfield, so they sent me up here to do my driver's training. And then ... I was coming down town on a night time and partying, basically. And then I, I met my missus! JW: Where did you meet you missus then? Were you partying on the night you met? DW: LAs. It's knocked down now, it's not there anymore. But yeah, every time I pass that place I remember it, yeah, that's where we met! JW: Where did you get married? JW: So tell me then about – well two things I want to find out actually, there was a hint before we started this recording as to how many children you have now. So how long have you been married? I still haven’t worked out exactly how old you are at the moment. DW: Growing up as a family and ever since we’ve lived as a family pretty much. JW: What does your wife do? JW: You can’t just have one lad so can you? JW: So whereabouts do you live? DW: I live off Bricknell Avenue around Appleton School, down Wyke you know Wyke College. JW: Yeah. Have you always lived in the west of the city? JW: Why have you made Hull home? DW: Well – my missus she really like it here. She enjoys it here. It’s nice and quiet compared to London. Originally I wanted to move back to London but she liked it here. Hull for me, because I’m not a really outgoing. Hull for me is chilled out so if we’re comparing negatives and positives, I realise that - the positives outweigh the negatives even in terms of even people. The way they behave and – towards you. Whether they are welcoming or not. I always find that for me, my personal experiences are that I always find more that are welcoming than not. JW: How do you think Hull has changed over the years that you’ve been here? DW: I, I think the city have, have developed. I think – in terms of jobs, I think there is more job opportunity – in terms of people living – different cultures living here, I think it’s gone a lot better. I think it’s a lot better, yeah. I think people are integrating better I think over the years that I’ve lived here. I’ve always found that it was most of the time welcoming for people that live here, the locals. JW: Do you have the strong Jamaican culture as a family? DW: - I would say mixed because - my wife, she’s originally from - the Congos. The reason she moved over here is because of the fighting and then she came across as a refugee and - settled in Hull. We mix it up. Definitely some African in there definitely and some Jamaican in there, definitely British in there. JW: Have you been able to share anything of your cultural background with the people around you in your community? DW: Not that much I wouldn’t say. Not that much. Probably – because I’m not outgoing I would say. My missus she’s got lots of friends. Me I can count my friend on one hand. But she’s got like loads of friends so you know she’d be teaching them different languages and stuff. I’ve only spoken one language technically anyway apart from patois which is broken English. But she likes stuff like that. For me it’s pretty much work and home really. Play a bit of football with my friend at the weekend and stuff that. I still play football. JW: Do you feel that you’ve fulfilled your ambitions? DW: I feel as if I’m getting there. Even though I said I’m a qualified electrician. I went to Hull College and did 2 years – which I gain a Level 3 and Diploma in Electrical Installation. I still need to what they say is a fully qualified electrician is when you need to do is do your NVQ. So I still need to do my NVQ to qualify as a fully qualified electrician, even though I’ve done the paperwork and naturally done the practical work so I need to complete that and then I would say that dream is one of my biggest dreams and I would have achieved that if I manage to. JW: And what about travel? Have you and your family been back to Jamaica or Africa? DW: I haven’t been to Africa but I have been back to Jamaica. But – that’s something we look at doing. JW: How does that feel when you go back? JW: So when you do go back, do people know of Hull? What do they know of Hull if anything? DW: When I do go back I wouldn’t say they know much of Hull even though, well my close family they would know about Hull because obviously I speak to the a lot on the internet and stuff and they know about Hull but they do know about England but specifically if you say Hull maybe Yorkshire because of cricket and stuff like that, because Jamaica is big on cricket, well it use to be but – yeah. So they know about Yorkshire cricket. JW: So how, how would you describe Hull to the people back in Jamaica or your wife’s family in Africa. JW: So what do you do as a family to relax? What do you like doing together as a family? DW: I think me – as a family I think staying in the back garden and playing ourselves different sports. I mean the other day we were playing wheelbarrow race. So, so we get up to all sorts of interesting stuff - cook together and all sorts of things. JW: Do you think Hull is going to be your forever home? DW: - I think so yeah. JW: What about your children? You mentioned that your eldest is 18 – a daughter is that? JW: Is she be going off to university? DW: She will be going off to university - soon, yeah. JW: What are her interests? DW: Law, that’s what she’s interested in. She wants to study law. She’s doing that at A’ Level at Wyke College at the minute. There’s a few universities that are willing to accept her if she gets the grades and I don’t see any reason why she shouldn’t. She got 6 GCSEs, good grades; As, Bs and Cs so she, she’ doing alright for herself. DW: - no because – we, we certainly thinking about – an extension on the house and we were talking about bedrooms and stuff and she said she would always like to have a bedroom in the house. We were talking about, well you’re not going to be here anymore so you won’t need your bedroom and she said, “No, I need my bedroom. I’ll always have a bedroom here”. So yeah. She feels very much even though when you become a teenager, most teenagers they want to move away, I don’t get that feeling from her because she loves home even though she’ll go away and that and come back home and – she will always be welcome as well so yeah. DW: Personally so. First of all is to become a fully qualified electrician and then after that I would like to, well I’m working as an electrician but I still need to get some more experience and after gaining that experience, I’d like to, well I’ve started my own, well that is like a side job. My company name is Mystic Electrician – which – hopefully I will be able to do full-time. Work as an electrician. JW: Why, why Mystic Electrician? JW: Any plans for travel? Any countries you would like to go to? DW: Well I would like to definitely go to – I would like to see Africa, some part of Africa in the near future. The missus at the minute is planning for us to go to Dubai so we’ll see how that one goes. JW: And what about say plans for your children too, what about ambitions for your children? DW: Well my main ambition for my kids is to make sure they get a good education and to help them as far as is reasonably possible to help them get that education. I mean in the UK, yeah you don’t have to pay school fees but in a sense you do pay it but not directly, indirectly through your taxes and stuff but - for them to understand and appreciate that a good education most of the time do help so. My ambition for them, I try and save a bit for them a well so when they finish - say college, they can access that money and if they can use it to help them to better themselves. That would be good. JW: Would you say that you’re life has turned out as you had expected it to? DW: - I would say, yeah, 90%. JW: And – people listening in to the podcast then. If there was one clear message that you wanted to give to them, things that you have shared with us, what would that be? DW: That – you should never give up. You should always continue – to – try and achieve your goal. And that would be the main thing probably because – me gaining my electrical qualification at such a late stage, I mean in High School back in Jamaica they said my grades weren’t good enough even though that’s what I wanted to do. That was my first choice, they wouldn’t let me do it so me gaining it at such a late stage I would say – keep trying, whatever your goal is, keep trying to achieve it.